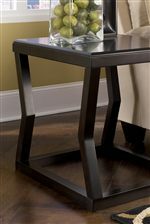 The clean lines of the angled legs of this rectangular end table add cool, contemporary style to your decor. 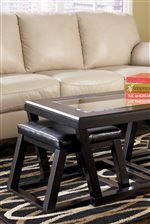 The wood top and frame of the table are constructed of select veneers and hardwood solids with a dark Espresso finish. You will love the simple sophistication of this end table for your home. The Kelton Rectangular End Table by Signature Design by Ashley at Beck's Furniture in the Sacramento, Rancho Cordova, Roseville, California area. Product availability may vary. Contact us for the most current availability on this product. The Kelton collection is a great option if you are looking for Contemporary furniture in the Sacramento, Rancho Cordova, Roseville, California area.